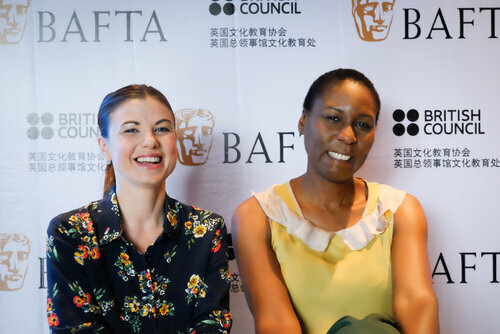 In June 2018, BAFTA partnered with the British Council, to support me and producer Dionne Walker to go to the Shanghai International Film Festival. As well as attending screenings and events, we were there to learn about the Asian film and television industries and the new opportunities arising as these sectors open up globally. It was an extraordinary experience. We met a huge variety of people, from the government agencies that oversee co-productions and China’s biggest production company (television, online and film) to some smaller independent filmmakers and Shanghai-based British companies, which set up co-productions and introduce existing British television to the Asian market. We were given a fantastic overview of the local industry, how it works, what they are looking for and where the opportunities lie for British talent. Tencent is one of China’s biggest production companies and they shared with us their process for developing new work – particularly television, where they develop their own intellectual properties (IP) in-house and use various platforms to build an audience before a show is put into production. A personal highlight was meeting film producer Nansun Shi, a pioneer in the Hong Kong film industry. The Asia New Talent Awards gave us the opportunity to see the exciting work being created in Asia and the brilliant up-and-coming talent who are making it. We also attended the Asia New Talent Awards, which gave us the opportunity to see the exciting work being created in Asia and the brilliant up-and-coming talent who are making it. Among the emerging talent, it was heartening to see a decent number of female directors, writers and a particularly large number of female DPs nominated and coming through the industry. For me, the best thing about the trip was the time I spent with the three peer mentors I was introduced to in Shanghai: actor/writer Ludi Lin and filmmakers Wen Ren and Sky Wang. They were all hugely knowledgeable about the Chinese film industry, but more than that, I got so much out of talking to them as experienced filmmakers – as writers, directors, producers, actors. They face the same challenges I do – as well as those I haven’t experienced yet – and offered invaluable advice on finding ways around them. The best part of the trip was the time I spent with our three peer mentors... They were all hugely knowledgeable... and offered invaluable advice. I also loved the experience of Shanghai, the city, including our peaceful base at The Middle House Hotel in Jing’an, the beautiful Bund, the French Concession and the ancient Jing’an Temple sitting in the middle of the modern city. I’d been told a few times that the food in Shanghai is something special and it really was. It was great to spend 10 days immersed in the city’s culture and get a sense of it as a place, its cinema, people, museums, gardens, shopping, food, the metro and its iconic buildings. We were lucky to have Jan and Claire from BAFTA as our guides to the city, supporting us through every part of this trip. I think we often concentrate on the differences in drama, because it creates unique conflict, but this trip showed me the huge amount we have in common, as both people and filmmakers and how we can share that knowledge and those ideas to work together. It’s really exciting that our industry is opening up; suddenly, we have the opportunity to reach a global audience like never before and also access work we previously might never have had the chance to see. I made so many useful contacts, I learnt huge amounts, both about the Chinese film industry and the film industry as a whole. I am hugely grateful to have had this opportunity to develop my career. It’s really helped me focus on what I want to do next. BAFTA-nominated writer/actor Sarah Quintrell was named a BAFTA Breakthrough Brit in 2017 for her screenwriting debut, Ellen. Find out more about her here.